Brooklyn-based, Singaporean street artist Sheryo is a hard one to track down. While being an established artist in her own right, she spends most of her time exhibiting overseas or painting walls. While this isn’t new for a lot of artists around the world, it’s clear that the appeal of her artwork also crosses borders. And with influences that range from tattoo to cartoon animation, it’s easy to see to see why a lot of people connect with her work. We tracked down the perpetually busy artist to ask a few questions about her recent travels and upcoming adventures. Since about 2009 you’ve been spending time in a number of countries. Tell us a bit about where you went and some of the experiences as a whole. I lived in Cambodia for five months in 2011, then moved to New York for eight months, and am now travelling again. The most recent places I’ve been are Vietnam, Thailand, Cambodia, Australia, Dubai and Mexico with The Yok. We painted some vases in a ceramic factory in Vietnam, which was so much fun and the people were amazing. We didn’t speak a word of Vietnamese, but still had heaps of fun. On the last day we went to a karaoke bar and we partied while singing cheesy songs with the locals. But I also got pick-pocketed on the second day. Luckily I got my money back after chasing the thief down the road. Also, while I was painting in Dubai for Tiger Translate recently, I saw some pretty amazing architecture out in their desert. How important do you think it is for an artist to travel and paint in new places? Do you think it’s a necessity? Travelling’s definitely the best way to stay inspired and motivated. I would encourage everyone to do it – not just artists. I think painting in a foreign country is the best way to get to know the city and its locals. It’s the best thing ever and I never want to stop doing it. Have certain cultures inspired directly back into your artwork? My sketchbook’s a journal. I draw in it all the time when I’m on my travels, from the food I eat from things that happen to me to the people I meet. Also, I love discovering different cultures and traditional folklores, so yes, all these things translate into my sketches and work. You’re originally from Singapore. What’s the street art scene like over there? The street art scene there is pretty tame, only because of the strict laws. But having said that, there’s still heaps of amazing talent. Singapore’s art scene is definitely growing and looking really promising. With the growing popularity of street art as of late, do you feel that women in the scene are getting more recognition and opportunities for their work? Definitely – it’s awesome. 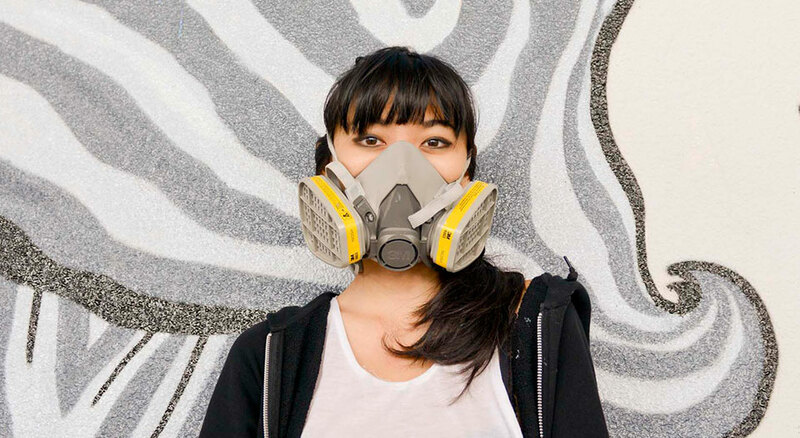 I was part of the recent Living Walls Project in Atlanta and it featured 26 female artists from around the world. It was rad meeting the other ladies who painted from around the globe. I wish there were more ladies painting out there! Your work blurs a line between Ren and Stimpy and tattoo design. How did you develop this style over time and who were some of your influences? I watched a lot of cartoons when I was a kid. Growing up, I really liked Mambo, Reg Mombassa’s stuff. All these influences slowly helped develop my style, I have been working on flash sheets lately because I love tattoos and I’m really bad at composition. You recently released a number of tattoo flash sheets. Are you thinking of playing with that artform at some stage? Yup! It’s in the works. If you’re interested in a tattoo, just hit me up! Who are some of the artists you think are really pushing it on a global scale at the moment? Some of my favourite artists at the moment are Todd Reas, Rime, Jay Howell and Barry McGee’s still killing it. You headlined Tiger Translate Dubai. How does it feel to be given the opportunity to leave your mark on a city not necessarily known globally for its street art scene? The whole experience was rad! I did a workshop with some local artists and they got to paint with spray paint for the first time! They didn’t want to leave and we ended up staying a lot longer than expected. How do you feel about businesses such as Tiger becoming involved with street art events like Tiger Translate? Do you think the culture has hit the mainstream, or has it found the best of both worlds? I think the culture has definitely hit the mainstream. It’s not necessarily a bad thing – artists can put food on the table easier now. Tiger’s doing pretty good: they’ve been hosting the event for the last seven years, which is a long time. Can you give us any hints as to what you think you will be putting up for the event? Installation? Animation? Murals? Is there anything you have planned for 2013 that we should know about? I have a two-person show with The Yok in NY called Yellow Fever later in the year. I’m also working on a new colouring book about a banana and a tomato and an iPhone app too. I really hope I can get to illustrate a cartoon series soon also – it’s what I’ve always wanted to do.